Celebrate the longest day of the year, Northern European-style. 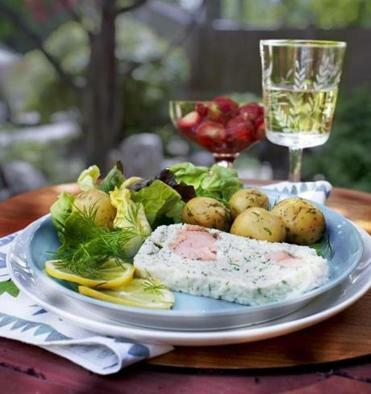 Strawberries, small potatoes, dill, and fish pate make for a solstice feast. When I was a kid, my stepmother sometimes made a version of this white-fish pate with salmon in the center for the holidays. Satisfying yet still light, it’s lovely for a midsummer celebration or picnic. Cut the flounder fillets into 1-inch pieces. In a medium bowl, toss flounder, wine, and lemon juice, and cover, then set in a larger bowl filled with ice and refrigerate for 2 hours. Drain before processing. In a food processor, puree the flounder and egg whites in four equal batches until very smooth, about 1 minute per batch, stopping to scrape the work bowl as necessary. Scrape pureed flounder into a medium bowl (you should have about 4 cups total), set it in a larger bowl filled with ice, cover, and refrigerate until very cold, at least 2 hours. With the rack in the center position, heat the oven to 350 degrees. Butter a 9-by-5-inch loaf pan. Cut a piece of parchment to fit neatly in the pan with a couple inches of overhang on the long sides, line the pan, use most of the butter for the paper, and set aside. With a hand-held or standing mixer, beat the flounder puree at medium-high speed to lighten it, about 90 seconds. Add the cream ⅓cup at a time, adjusting speed as necessary to avoid splashing and then returning to medium-high, until incorporated, about 45 seconds per batch. Add 1¾ teaspoon salt, ½ teaspoon white pepper, and the snipped dill, and beat on medium-high speed to combine, about 30 seconds. Spread about ⅓of the flounder mixture evenly in the loaf pan. Arrange salmon pieces in two evenly spaced rows. Spoon the rest of the flounder mixture over the salmon and spread evenly, then tap pan on the work surface a couple of times to release any trapped air. Cut and butter a piece of parchment and cover the fish, buttered side down. Set the loaf pan in a 13-by-9-inch baking pan, set the baking dish on the oven rack, carefully pour boiling water into the baking dish to reach about halfway up the sides of the loaf pan, and bake until the pate is firm and registers 135 degrees on an instant-read thermometer, about 1 hour. 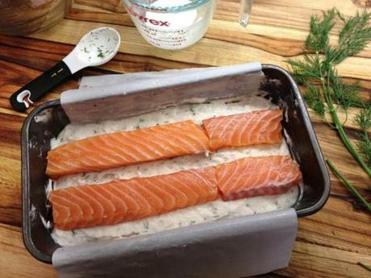 Transfer the loaf pan to a rack to cool; remove the pate from the pan to a platter, cover, and refrigerate overnight. Decorate the pate with dill sprigs and some of the lemon slices and serve chilled or at room temperature. The method of adding dill to the cooking water comes from my Finnish friend Liz Ekwall. In a Dutch oven or very large saucepan, cover the potatoes with water by about 2 inches and bring to a boil over high heat. Twist the dill sprigs to bruise them, add sprigs and 1 teaspoon salt to the potatoes, cover, adjust heat to medium-low, and simmer until potatoes are tender, 18 to 24 minutes. Drain potatoes and discard dill. Return the potatoes to the pot, add the butter, and toss to melt butter and coat potatoes. Add ½ teaspoon salt, pepper to taste, and the chopped dill, and toss to distribute. Taste and adjust seasoning, if necessary, and serve at once. TIP: This is how the uncooked pate looks before the last of the founder mixture added. Slices of poundcake or plain butter cookies are nice accompaniments. Fresh, local berries should macerate for an hour or so, but supermarket ones can go longer— their texture barely changes even after 4 hours. In a small saucepan over medium-high heat, bring wine and sugar to a boil, stirring. Adjust heat to medium and simmer, swirling the pan occasionally, for 3 minutes. Off heat, add basil, cover, and set aside to steep for 1 hour. Strain the syrup (it can be covered and refrigerated for up to 2 days). In a serving bowl, stir the strawberries with the syrup. Set aside to macerate for at least 1 hour, and serve.